When I think about Aston Martins (Astons Martin?) inside my mind palace, I tend to skip over the 1990s almost entirely. I have my reasons for this. For one, James Bond was driving BMWs back then. And besides the DB7, there wasn’t much on offer besides the brutal Virage and Vantage. But even Aston Martin has had its share of concepts here and there, and one from the ’90s still sticks out today—even if it sat on a Ford Panther platform underneath its sheetmetal. By the end of the decade, Aston Martin would be rolled into the “Premier Auto Group” Ford division that also oversaw Volvo, Land Rover and Jaguar. Also Lincoln and Mercury for a minute? It was weird. As it was, Aston spent much of the 1990s ramping up production and modernizing its processes. Perhaps what we remember best from that era is the DB7, but it was introduced at the 1993 Geneva Motor Show alongside this sedan concept. What&apos;s The Greatest Car Of Aston Martin&apos;s Awkward Years? As Classic Driver notes, both the DB7 and Lagonda Vignale Concept were designed by a pair of brothers: Ian Callum and Moray Callum, respectively. Moray was at Ghia at the time. Supposedly it was built to gauge public interest in a sedan Aston Martin at the time. The concept also blew the dust off the Lagonda brand after decades. But I’m probably not spoiling anything when I tell you only one of those designs actually made it. 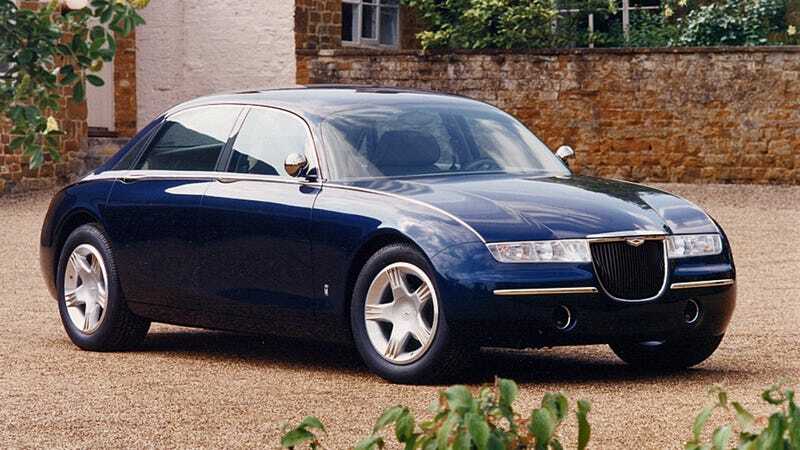 The DB7 was in production for a decade, but the Lagonda Vignale remained just a concept. Classic Driver said reviving Lagonda was deemed too expensive by Ford, and that Aston Martin’s GT coupes could carry on the tradition a little better. They probably weren’t wrong, but it’s a shame this particular design never got to see the light of day. I think it’s quite lovely. It has that sleek, geometric look that a lot of the best concepts had in the 1990s going into the 2000s—think the original Audi TT and Volkswagen New Beetle—while managing to look unlike anything else before or since. It’s vaguely Lancia-like or Rolls-Royce-ish, but does its own thing. I love the curved hood and trunk. And those deep-dish wheels! Very nice. Looks suitably sharp and classy inside, too. But perhaps what’s even more interesting is what lies under the skin: as I mentioned, a Lincoln Town Car chassis, a Ford 4.6-liter Modular V8 and a four-speed automatic. Those specs are just for the concepts, however. It’s not surprising Ford would have used off-the-shelf stuff for the show cars. At least two of those were built. A few sources say that the Sultan of Brunei was involved, others do not. But AstonMartins.com, a database of information about the brand and its history, and Classic Driver both imply that had the Lagonda Vignale actually gone into production it would’ve had a 5.9-liter V12, that being the Aston Martin Vanquish engine, an all-aluminum chassis (same there) and a fully independent suspension (same there again). Alas, this was not to be. Would the luxuriant masses have accepted an Aston Martin sedan that shared a platform with a New York City taxi cab? That, I don’t know. But it is proof that, for a brief shining moment, the Panther platform got even classier than you ever knew. At $3,975, Could This 2011 Ford Crown Vic Interceptor Be Your Blue Light Special?